I recently acquired a small collection of stereo-cards from around 1920 which were images taken by a British photographer who toured the battlefields at this time. They give a fascinating insight into what the battlefields looked like in this aftermath period and some of them will feature on the blog this week. This image is taken in the main square in the town of Péronne, a small town on the Somme used as a headquarters by the Germans from 1914-17, the British in 1917-18 and retaken by the Germans in March 1918 until captured later that September. 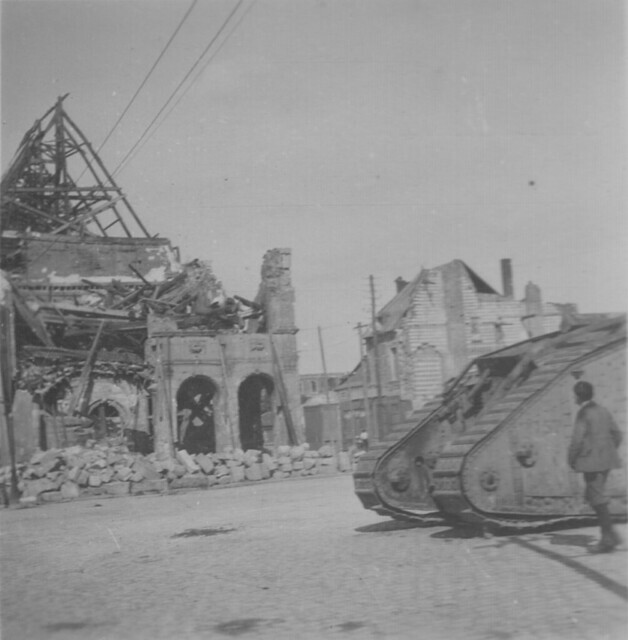 The ruined building behind was the town hall used as a headquarters by the Australians after the capture of Péronne in September 1918 and they remained the street in front ‘Roo de Kanga’ – the local mayor officially renamed the street with that name in 1998 on the 80th anniversary of the liberation. Under German occupation before 1917 the town hall once bore a sign in German which read “Nicht argern nur wundern!” (“don’t be angry only marvel!”) and which is now in the Historial museum in the town. The tank is likely to be a MKIV or MKV, both used in the fighting around Peronne in 1918. The young man in the image is likely to be the photographer’s son as he appears on other photographs that will appear this week. This entry was posted on 26/03/2012 by sommecourt. It was filed under Aftermath, Battlefields, France, Somme, Tanks, Western Front, WW1 and was tagged with Aftermath, Battlefields, Peronne, Somme, WW1. This is a much better copy of this image than I’ve seen previously and you can read a partial serial number on the tank of 757. As this is a Mark IV (definitely not a V) the number must be 2757, which makes this tank a Mark IV Female of G/7th Battalion Tank Corps. This tank had a long service history, first appearing as G44 “Glengarry” on 31 July 1917 and last heard of (until now) serving with C Company 7th Battalion on 30 September 1918 at Tilloy. Thanks for sharing it.